Luang Prabang (Lao PDR) – April 5, 2019 (travelindex.com) – The ancient city of Luang Prabang is considered to be the cradle of Lao culture. Nestled in jungle-clad hills at the confluence of the Mekong and Nam Khan rivers, this enchanting destination is the former royal capital of Laos and a beautiful UNESCO World Heritage-listed city. Newly-opened, Pullman Luang Prabang showcases the best aspects of northern Laos, past and present. Spread across 16 hectares of landscaped gardens, complete with reflective ponds, tumbling streams and working paddy fields, this refined low-rise resort features 123 rooms, suites and a two-bedroom pool villa, all designed in an architectural style that blends seamlessly with its natural surroundings. As part of Accor’s prestigious Pullman brand, this international resort features a wide selection of world-class facilities, including the largest conference space in Luang Prabang, three inviting swimming pools, a serene spa, a 24-hour fitness centre and a kids’ club. L’Atelier is the stunning lakefront dining destination, while The Junction is a sophisticated lounge and library serving drinks and snacks, and H2O is the resort’s refreshing pool bar. Guests can embrace the spirit of Luang Prabang with a series of authentic activities, locally-sourced cuisine and unique opportunities to interact with the local community in a responsible and sustainable manner. Food is big part of life in Laos and Pullman Luang Prabang focuses on creating exceptional culinary experiences for its guests, in line with a farm-to-table concept. Executive Chef Marc Comparot focuses on local, seasonal and organic ingredients, including Lao herbs, vegetables and tropical fruit grown onsite. The resort’s own terraced paddy fields, covering 1.3 hectares, produce the rice for the restaurants, and guests – including corporate groups – can help with the harvest. A recent haul saw 3.2 tonnes of rice harvested and distributed to the local community. Rice husks, a byproduct of the cultivation process, are donated to MandaLao Elephant Conservation Camp – one of the many forward-thinking CSR projects already adopted by Pullman Luang Prabang. Chef Marc also sources several types of cheese from Laos’ first buffalo dairy farm, and guests can visit this socially-responsible enterprise which provides support and education to local farmers. Alternatively, families and groups can head to Ock Pop Tok, a sustainable textiles business that empowers the women of Laos. Back at the resort, Pullman Luang Prabang offers a series of activities that allow guests to appreciate the beauty and tranquility of this exquisite destination. From invigorating morning yoga and tai chi classes on the resort’s rooftop deck, to alms-giving at Buddhist temples in the UNESCO-listed city, unforgettable adventures await every guest. In line with Accor’s Planet 21 programme and the resort’s own sustainable philosophy, Pullman Luang Prabang also uses locally-made bamboo straws and refillable water bottles to support local communities and preserve the environment. “Luang Prabang is a captivating destination that perfectly showcases Laos’ rich cultural heritage, from the spirituality of its temples to the fresh produce of its fields and farms, inspiring architecture and traditional arts and crafts that have been passed down through generations. At Pullman Luang Prabang, we aim to embody the charm and elegance of this UNESCO-listed destination while also supporting the community and leaving a very light environmental footprint. 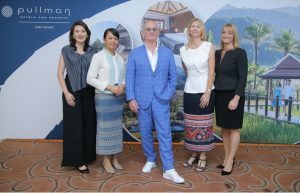 Through our creative cuisine, authentic design and local CSR collaborations, we invite guests to experience everything Luang Prabang has to offer,” said Denis Dupart, Pullman Luang Prabang’s General Manager. Pullman Hotels & Resorts delivers an experience that is upscale, upbeat and perfectly in tempo with the global zeitgeist. Against the backdrop of today’s fast paced life, Pullman helps guests be at their best, in business and at leisure, enabling them to seamlessly conduct business, explore the locale, workout and make connections – to the neighborhood and people around them. Retaining the values of exploration, comfort and dependability that drove it to become a pioneering travel brand over 150 years ago, Pullman today features more than 130 worldwide properties including Pullman Paris Tour Eiffel, Pullman Park Lane Hong Kong, Pullman Shanghai South, Pullman London St Pancras and Pullman Sao Paulo Vila Olimpia. Pullman is part of Accor, a world-leading augmented hospitality group offering unique and meaningful experiences in 4,800 hotels, resorts, and residences across 100 countries. Copyright © 2019 Visit Colombia. All rights reserved. Powered by Travelindex.